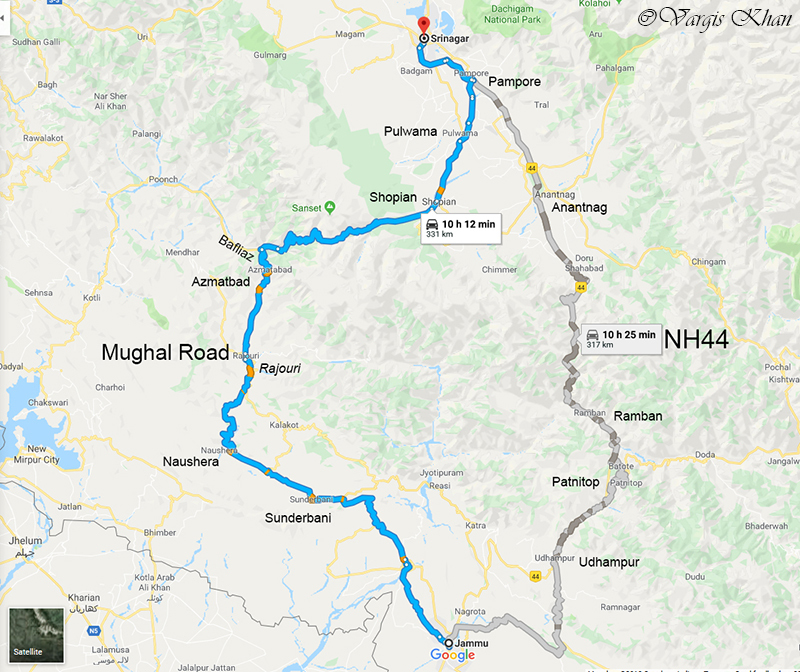 Srinagar Jammu National Highway, also known as NH44, is often considered to be the only road connecting the cities of Jammu and Srinagar. True that it is indeed a better maintained, wider, more traveled upon, most known and shorter way to travel between the two places but it it is definitely not the only one. 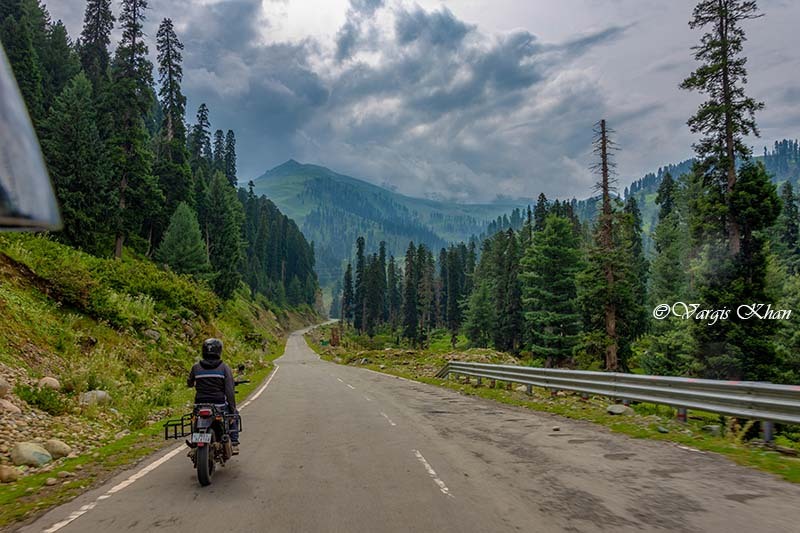 There actually exists another route that is far more scenic, less crowded, takes you through some internal parts of Kashmir; and has existed for far longer than the regular NH44 highway. Yes I am talking about the historical Mughal road; the route that was used by Mughal Emperor Akbar to conquer Kashmir; and where his son Emperor Jahangir died near Rajouri while on his way back to Delhi. This route is also my preferred way of reaching Kashmir and I will highly recommend it over the crowded NH44. How you can plan your journey on this road is what I will be providing details on in this article. The picture below if of the spot where the Mughal road begins in the apple town of Shopian. Total length of Mughal Road is 84 kilometers but that is just the distance between Shopian and Bafliaz. These 84 kilometers between the two towns crossing Peer ki Gali is the stretch called Mughal road. However the total distance between Jammu and Srinagar via this route is far greater; a total of 330 kilometers. From Jammu, you will first reach Bafliaz via Rajouri covering a total of 177 kilometers. You will then enter Mughal Road and travel 84 kilometers till Shopian. At Shopian, the Mughal road will end and you will travel another 65 kilometers to Srinagar. The same journey will follow the other way around if you were traveling from Srinagar to Jammu. Off-late however, this entire stretch of 330 kilometers has started to get referred to as Mughal Road; rather than the actual 84 kilometers long stretch between Shopian and Bafliaz. Why is it Called Mughal Road? This was the route that was first taken by Akbar to cross over into Kashmir and conquer it. After Akbar, same road was used by Jahangir, Shah Jahan and Aurangzeb to travel here. While returning back from Kashmir to Delhi, Jahangir as a matter of fact died on this route near Rajouri. To rebuild this road was proposed in 1950s, with the intention of improving the economy of the valley of Kashmir. It however remained on papers for a long time; until then Chief Minister Sheikh Abdullah took up this project in 1979 and named it “Mughal Road” due to all the history related to it. Though the route was in use by locals since forever but an official road on it was not completed on papers until 2010 actually because of all the delays due to terrorism and protests related to wildlife. 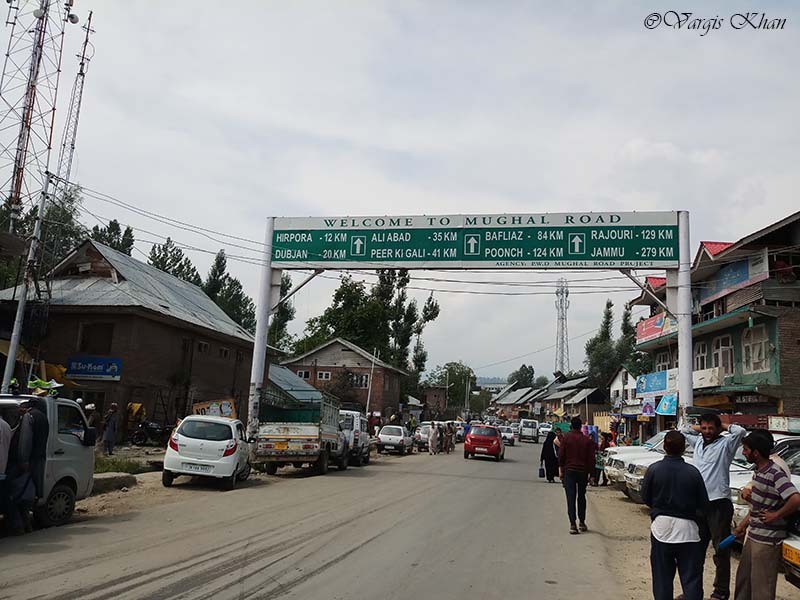 So why chose Mughal road over NH44? There are a few reasons actually. The first reason of course is that it is far more scenic and takes you through some internal Kashmir areas. It gives you a real taste of what Kashmir is all about rather than keeping you on a highway and rushing through the journey. The scenic high altitude pass of Peer ki Gali that you will cross on the way is a sight to behold. Second reason is that it is never crowded whereas NH44 has a history of long traffic jams and an endless line of trucks waiting to get by. There is no toll required on Mughal road so that could be another reason to plan a journey on it. Do note though that it is a two-lane highway at some places so you cannot really rush or fly on it. It takes you through some villages and towns; so you will have to drive carefully. Below is the route map of Mughal road route. The route highlighted in grey is the usual NH44 passing through Udhampur, Patnitop and Anantnag. The one highlighted in blue is the Mughal Road route. The route from Jammu to Srinagar via Mughal Road will be as below. The same route will get followed the other way around if you were traveling from Srinagar to Jammu. From Jammu till Bafliaz, you will be traveling through one of most remote and scenic parts of Kashmir, the Poonch district. The entire journey will be full of breathtakingly beautiful views. You will then take the turn from Bafliaz inching towards Peer ki Gali pass and the journey will turn all sorts of adventurous. The small town of Chandimarh will feel buzzing like Chandigarh. The road will turn narrower, bumpy and rough in patches. Mounting over the mountains, taking steep curves, the river will get lost somewhere at the foothills. The steepness will be enough to scare and excite you at the same time. Every single turn will provide you with a magnificently splendid view. And then you will hit the highest point, after traversing the entire up-hill track at the Peer ki Gali Pass; where flat pastures are ever ready to greet the traveler. The Pir ki Gali Pass stands at 3490 meters above Sea Level; getting it’s name from a local saint, Pir Baba Sheikh Karim and ‘Gali’ meaning ‘pass’. Afterwards, the journey is all downhill but the amazing vistas will continue to spellbind you. You will feel like stopping at every turn to click as many pictures as possible. The road will then finally turn smooth and broad; and you will be greeted with an endless series of Apple Orchards. Yes you would have entered the Apple town of Shopian where Mughal road terminates. From Shopian, you will continue driving through apples on both sides of the road before finally hitting the NH44 at Pampore. After Pampore, it is a smooth and straight run to Srinagar. How to Plan a Journey on Mughal Road? Now there are two way that you can plan the journey on this route. First is that either you traverse from Jammu to Srinagar or vice versa; or you just travel on Mughal road from Srinagar, making it a single day journey. For people traveling by their own vehicle, I will recommend that you use NH44 to reach Kashmir; covering that part of the route. 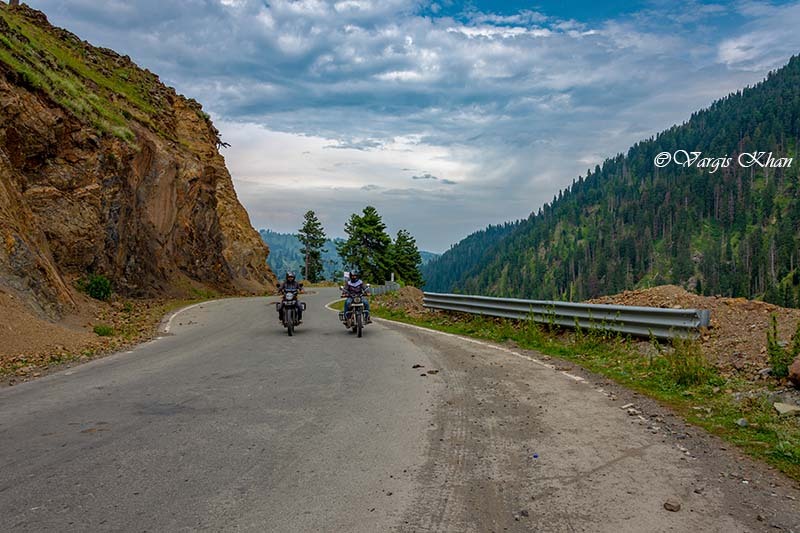 And then for your return journey home, you take the Mughal Road route; hence making sure that you do not travel on the same road once again and also explore the valley some more while on your way back home. For people who traveled straight to Srinagar; and are a bit short on time, you can make a days journey to cover Mughal road and be back to Srinagar by evening. If you do not want to complete the entire Jammu to Srinagar journey, or do not have time for it, then you can just cover the 84 kilometers of Mughal road from Shopian to Bafliaz. You can make this a day trip and also include a journey to Aharbal waterfall. From Srinagar, start really early, say by 6 AM. You will first travel to Shopian which will take you about 2 hours. From Shopian, Aharbal Waterfall is about 15 kilometers so go that way first and come back to Shopian again. This will take another 2 hours at most. By then it will be 10 or 11 AM at most leaving you plenty of daylight still. 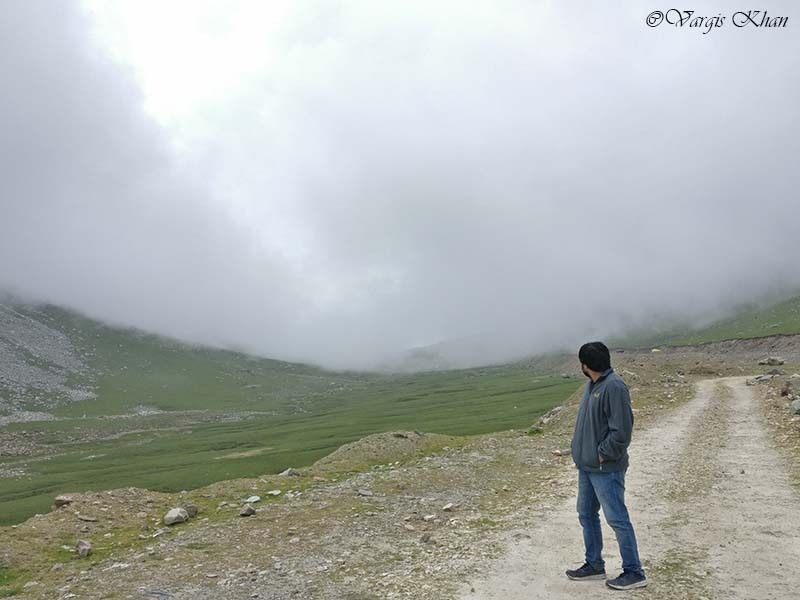 From Shopian then, climb up to Peer ki Gali Pass, spend some time there, continue descending on the other side of the pass and reach Bafliaz. Take a break at Bafliaz, eat something and then travel back on the same route to Srinagar via Peer ki Gali and Shopian. Or what you can also do is to start from Srinagar early and go straight to Bafliaz via Shopian and Peer ki Gali. Then while on your way back, take the turn towards Aharbal from Shopian and cover it as well. Read How to Plan a Trip to Aharbal Falls for more details on covering Mughal road in this manner. Is Mughal Road Safe to Travel On? Now let me talk about the question that always gets asked when someone talks about visiting anywhere in Kashmir. Is Mughal Road safe to travel on? If you were thinking this in terms of all the terrorism activity then yes, Mughal road is safe for tourists like any other road in the country. You will not face any problem or feel threatened anywhere on the route. However, do your homework before you start the journey. Keep an eye on the news and if there is any word of unrest or ongoing protests in the valley, then you are better off postponing your trip for until things have cooled down. I have covered the topic of tourist safety in Kashmir in another article, How Safe Kashmir is for Tourists to Travel. Take a look at this article for some more details; and a few tips on how you can complete your trip safely. If you were however talking about safety in terms of terrain then yes, the road is safe in that manner too. It does get a bit narrow and steep near Peer ki Gali Pass but as long as you have some experience in driving and know how to maneuver your vehicle then you will easily be able to handle it. Mughal Road is a mix of good, bad and average but mostly an average road. It is a two lane highway with no divider in between so yes it does get a bit narrow at places with traffic coming at both sides. From Jammu till Bafliaz, the road mostly remains straight and in OK condition. From Bafliaz there is a steep climb till Peer ki Gali Pass with some bad patches in between. It will continue in the same condition for the downhill slope as well till Shopian. There are several under construction patches and shooting stone areas so drive carefully. From Shopian till Srinagar, the road is mostly smooth. There is really no best vehicle for planning a journey on Mughal road. The road never gets too tough to climb and never too bad to cross. I have seen locals traveling around on it in Maruti 800 so you can imagine the difficulty level of it. The only time when you are actually going uphill a bit steep is when you are approaching Peer ki Gali; either from Shopian or Bafliaz. Rest of the times, all the way between Jammu and Srinagar, the journey remains smooth. As long as your vehicle is well serviced and decently maintained, it will easily be able to cross Mughal Road. It applies for both car and motorcycles. You can book at taxi for traveling on Mughal road from either Jammu or Srinagar; depending on where you were coming from. Usually a private cab on this route will cost you around Rs. 2000 per day for a hatchback and Rs. 2500 for a SUV. Hatchback will be most probably an Etios or a Maruti Hatchback. SUV will either be a Bolero, Scorpio, Sumo or an an Innova. Charges will be inclusive of fuel and the driver. There will however be no AC in the vehicle. If you need an AC Cab then you will have to pay more. In my opinion though, you don’t really need an AC taxi when you are traveling through Kashmir. If you were however traveling by a Bus then your journey will have to be broken in two parts. There is no direct bus from Jammu to Srinagar via Mughal road. From Jammu, you will first have to catch a bus for Rajouri and then from Rajouri, you will have to find a bus for Srinagar. If you were traveling from Srinagar to Jammu, then you will have to first board the Srinagar to Rajouri bus and then from Rajouri to Jammu. Frequency of these buses however is not that great and the timings may not match yours. For example, you may arrive at Rajouri to find that there is no bus for Jammu or Srinagar until next day. In this case, a shared cab will be your only option. For booking tickets and to confirm the timings of these buses, you can call at 0194-2502290 and 0194-2483689. These are available on these routes in plenty and will be the best choice for anyone traveling by public transport. In most of the cases, these cabs are either a Sumo or a Bolero. From Jammu, you can reach Rajouri via JKSRTC bus. You will have to then catch a shared cab for Shopian from Rajouri and then another shared cab from Shopian for Srinagar. Same way, traveling from Srinagar, you will first have to board the daily Srinagar to Rajouri bus and then look for a shared cab for Jammu. There are really no specific tourist places that you can cover while you are on your way. The journey from Jammu to Srinagar via this route will actually easily take you about 11 to 12 hours so you will not have much time for sightseeing; unless you were planning to do the journey in 2 days. The natural beauty of the route is its biggest attraction. As I mentioned previously in the article, you travel through the actual Kashmir region and get a true taste of it. You pass through Kashmiri towns and villages rather than staying on a busy highway behind trucks. Peer ki Gali Pass is the biggest attraction on this route and also the most scenic stretch. For more details, please read, Peer ki Gali – The Heart of Mughal-Road. This road passes through some major towns like Sunderbani, Rajouri, Bafliaz and Shopian; all of which have Banks and ATM facilities. Like Banks and ATMs, gas stations too are available at regular intervals. Mechanics are also available at all the towns I mentioned above. One day is all that you need to cover Mughal road and I wouldn’t recommend any more time that this unless you want to stay at any of the towns in between and explore some remote areas of Kashmir. Rajouri has a few hotels where you can stay for a day if you want to but there isn’t much to see here. Even if you just wanted to visit Mughal road from Srinagar, even then the journey can easily be completed in a day; to and fro Srinagar. I hope the information above on visiting Aharbal was of help. If you need any further details, please feel free to ask in the comments section below; or at our Community Forum; and I will be glad to answer.